Can $1 million (and growing) in membership fees, plus a lot of help from the Department of Energy’s most skilled scientists and highest-tech labs and computing clusters, turn California into a hub for research, development, and manufacturing of advanced batteries? CalCharge is set to find out. Launched in 2012 by the California Clean Energy Fund (CalCEF), CalCharge’s objective is to provide deep access to DOE labs for energy storage companies, whether they’re looking to test their novel battery materials and designs or to optimize the manufacturing processes to bring them to market. Last week, the nonprofit announced its first corporate members, ranging from giants like Duracell, Hitachi, Volkswagen, LG and Eaton to a host of California-based startups in the field. That list includes flow battery makers EnerVault and Primus Power, lithium-ion startups Enovix, Farasis Energy and Leyden Energy, and molten salt and glass thermal storage startup Halotechnics. Some have already begun working with Lawrence Berkeley National Laboratory and Stanford University’s SLAC National Accelerator Laboratory, the two DOE labs that are opening up streamlined cooperative research and development agreements (CRADAs) with CalCharge partners. It usually takes months, sometimes nearly a year, to set up CRADAs like this, but Jeff Anderson, CalCEF managing director and CalCharge’s president, said it’s completing its streamlined master agreements in weeks instead. Berkeley Labs has spawned several advanced battery startups of its own, and is well equipped in terms of testing facilities and expert scientists, deputy director Horst Simon said at a DOE clean energy manufacturing conference in San Francisco on Thursday. SLAC director Chi-­Chang Kao said the linear accelerator’s supercomputers were on the ready to “develop new tools so that people can understand how the battery actually works” -- not an easy task in today’s world of nano-structured, exotic battery materials. These are the kinds of resources that come at great expense, if at all, to most startups, Craig Horne, co-founder and chief strategy officer of Sunnyvale, Calif.-based EnerVault, said at Thursday’s event. While EnerVault is about to install its first 1 megawatt-hour system in a DOE-funded project in Turlock, Calif., he and his partners at EnerVault tried some of their first tests in his garage, he noted. “I’m thinking it would have been a five-to-one” cost reduction to get to where EnerVault is now, in terms of the value that CalCharge makes available in terms of lab space and technical expertise, he said. As for manufacturing, Anderson said CalCharge and its partners were engaged on a “comprehensive road-mapping process” to share member findings with the DOE, to help it decide which materials, process or technology initiatives it should focus on. Companies’ IP is protected in that process, he added, and while co-developed technology is generally jointly owned by the lab as well, the company gets an exclusive license to commercialize it, he said. With so much of the technology being developed and made in California, it makes sense to consolidate operations in the state, he said. Working against it, however, is the perception that only Asia can provide the low manufacturing and assembly costs necessary to compete in global markets. Even within the United States, California has apparently lost out to states like Arizona, New Mexico, Nevada and Texas as potential sites for Tesla Motors’ promised lithium-ion battery Giga factory. 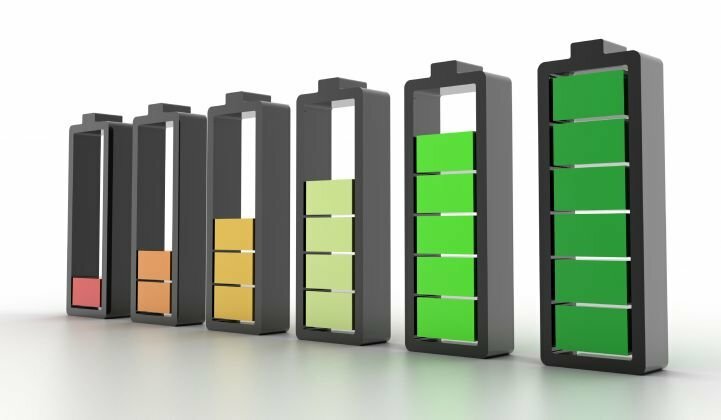 To get workers up to speed on the skills needed to build, install and operate mass-market energy storage, the National Electrical Contractors Association and the International Brotherhood of Electrical Workers have gotten involved. So has San Jose State University, which plans to start offering courses of study in battery technology and the business of energy storage as early as September, associate dean Ahmed Hambaba said. Right now CalCharge has a budget of about $1 million, much of it raised in membership dues that range from as low as $2,500 a year for startups to up to $50,000 for bigger partners, Anderson said. That’s likely to grow as more partners come on board -- about twenty companies are in various stages of work with the group, but haven’t made that public yet, he said. CalCharge isn’t the only program of its kind. The New York State Research and Development Authority (NYSERDA) is on a similar path in its home state, working with utilities like Consolidated Edison and state grid operators and regulators to design pilot projects for energy storage startups like Green Charge Networks and Eos Energy, as well as developing an energy storage incentive program to help New York make up for the proposed closure of the Indian Point nuclear power plant. Hawaii’s Energy Excelerator incubator is hosting energy storage startups in pilot projects meant to test their ability to balance solar and wind power on island grids. But California is set to be the world’s single biggest energy storage market, with a state mandate requiring utilities to contract 1.3 gigawatts of batteries, thermal storage, small-scale pumped hydro, fuel cells and other grid-scale storage solutions by 2020. That makes it a natural home for the R&D, manufacturing and installation expertise going into that mandate, Anderson said.